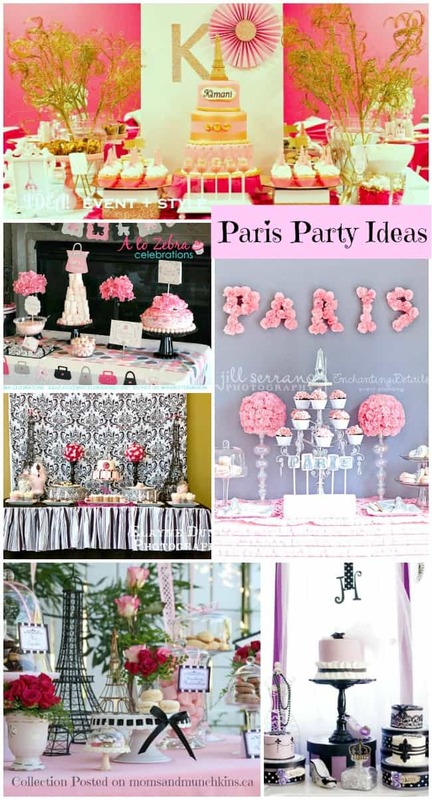 I love the idea of Paris-themed parties but with one son at home I think I’ll be planning more race car & monster themed parties than pink & frilly parties. 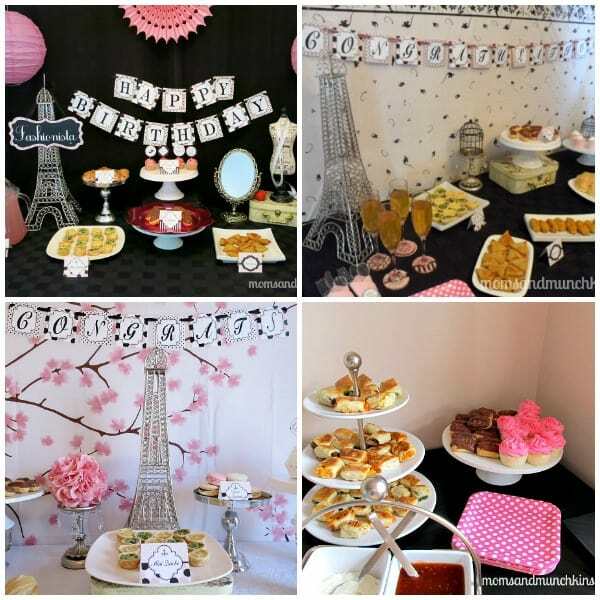 I happily put some of my Paris party inspiration & ideas to use in some posts on Moms & Munchkins that you may remember – Paris Fashionista, Paris Baby Shower, Paris Bridal Shower and Paris Birthday Party. Today I’ve gathered some gorgeous Paris-themed party ideas from some very talented party designers to share with you. I know you’ll find them inspiring! 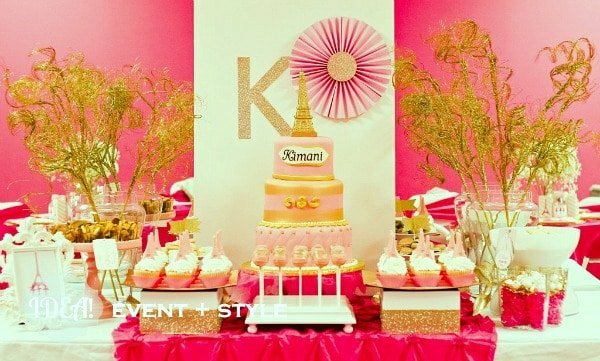 This Pink, Vintage Paris Party by The Little Things Creations and featured on Bird’s Party is full of creative ideas. The vintage touches make it a beautiful idea for a bridal shower. 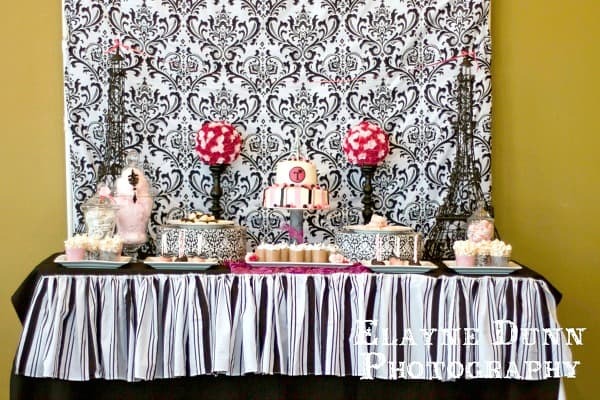 I love this beautiful Paris party table by Enchanting Details. The letters on the wall are such a sweet & unique touch! 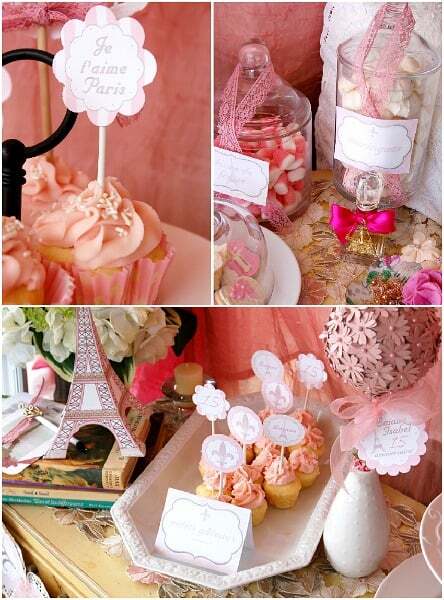 This Paris dessert table by Sweets Indeed is beautiful! 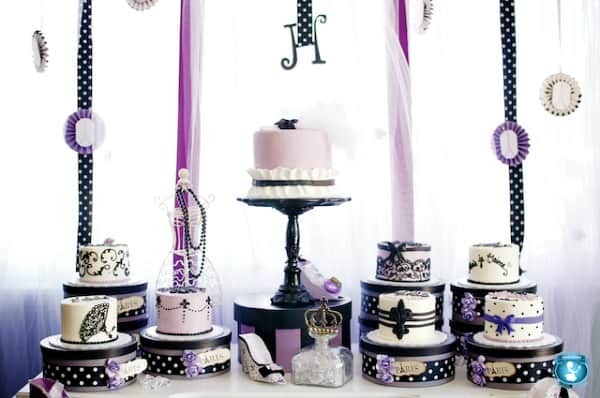 I love the fabrics used, the mini cakes and the decorative boxes. 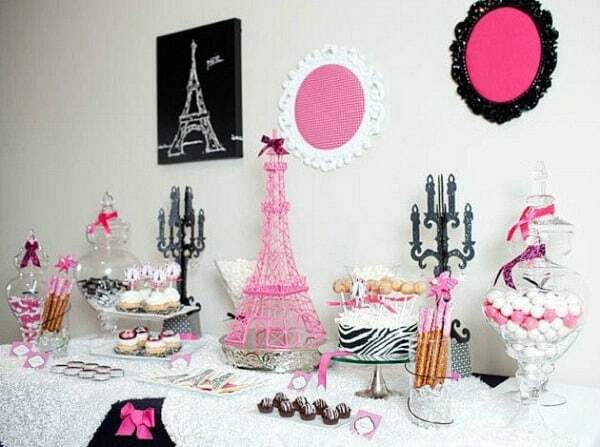 This elegant black, white and pink Paris party by Mariah of Giggles Galore combines two of my favorite things – the color pink & damask print! You’ll have to check out the full post to get a closer look at all the delicious desserts. 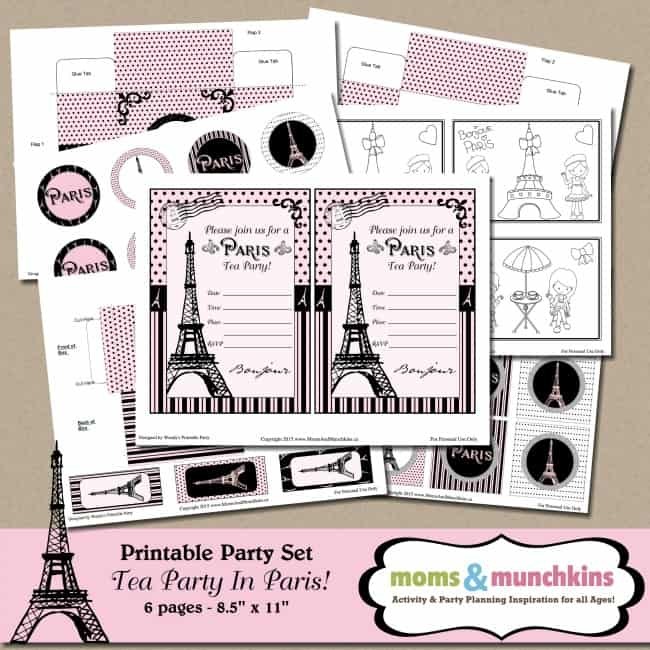 This fun Parisian Themed Ladies Night by the Pretty Lil Party Company featured on Celebrations at Home is perfect for a ladies night, bachelorette party or a birthday party. When is the last time you got your girlfriends together for a night out? 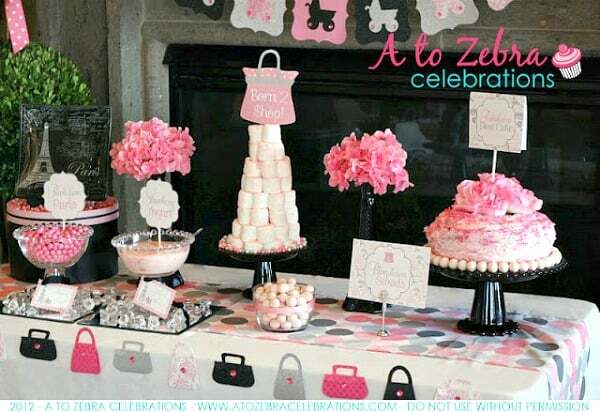 This Born To Shop Baby Shower by Nancy of A to Zebra Celebrations is adorable! 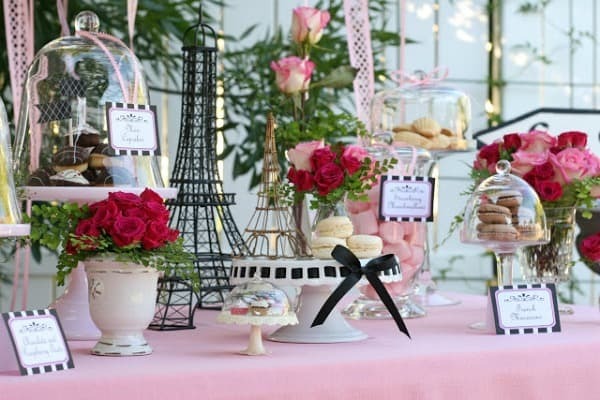 It’s simple yet totally sweet and a perfect little twist to a traditional Paris themed party. You’re never too old for a tea party! 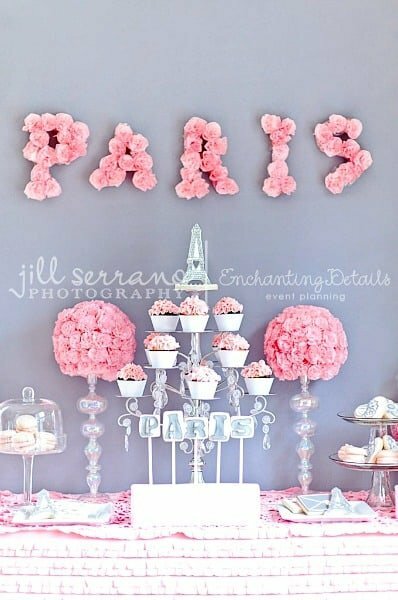 This beautiful outdoor Paris dessert table by Glorious Treats is perfect for a tea party, a bridal shower, a baby shower or birthday. I love the simple elegance! This Ballerina in Paris Party by Jasime of Idea! Event + Style is absolutely stunning! I love the unique combination of ballerina and Paris and the gold accents are so beautiful! For more creative party ideas, follow along on Facebook, Twitter, Pinterest and Bloglovin’. These are awesome ideas! I am overwhelmed by the effort so many people take on for their parties.